This kit is designed to remove blackheads, excess sebum without squeezing. It gently dissolves blacheads and sebum, while minimizing the appearance of pores. 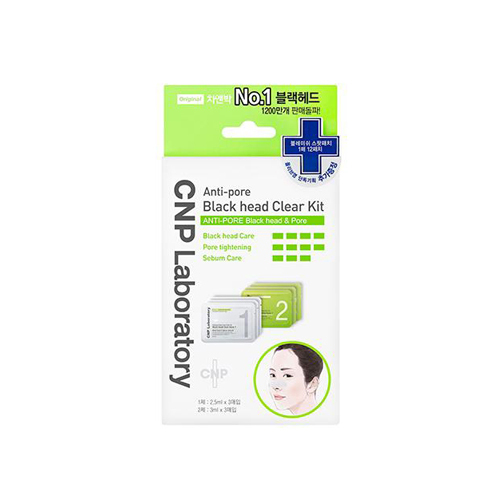 CNP’s patented Anti-Irritant Complex reduces skin irritation, making it suitable for sensitive skin. Apply basic skincare products after cleansing. Apply Blackhead Clear Mask 1 to area with blackheads for 10-15 minutes. Remove the mask and wipe your face clean with the enclosed cosmetic cotton. Apply Mask 2 to tighten the pores and rest about 5-10 minutes. Remove the mask and pat the area gently to absorb.